Welcome to Cashville! Click here to play! They say there are more billionaires per square mile here than there are millionaires per square mile in California. Yes, it's a rich old town is Cashville, but four tycoons in particular rule the roost and see that things get done in this town. At the bottom of the mega-tycoon ladder is Bette Boodle. She's something of a nouvelle riche type in the town, but she's managed to put her mark all over the place. Mostly in the form of incredibly tacky decorations, pearls, and a new currency she calls 'Glamour Dollars'. If you don't like pink, don't let Bette Boodle know. Next up is Sir Sterling, an English emigre who is one of the youngest businessmen to ever receive a knighthood. He only seems to care about cold hard cash, and that's find with most of Cashville's residents. Don't give him trouble, and you'll be fine in Cashville. Give him a hard time, though, and he'll make sure you regret it. Dame Von Deeds made her fortune in property, and she takes great pride in keeping herself in the very finest fashions. If you have a nice piece of jewelry, I'd suggest not wearing it around her, as she'll pester you for it. When she wants something, she gets it, so unless you want your house bought from under you, I'd give her whatever she asks for. Finally, Bill Bullion is a fake cowboy type of billionaire who you do not want to get on the wrong side of. He's incredibly generous if you get into his good books, but you'll have to smoke a lot of cigars to become closer to him. A nice enough man if you have the throat and lungs to hand around him. Well, that's about all a new resident here would need to go. If you end up making a fortune while you live in Cashville, remember your old friends, huh? The Scatter Dollar symbol pays out on the total bet when 3 or more appear on the reels. 3 symbols payout 8 times the bet, 4 payout 30 times the bet, and 5 payout 300 times the total bet. The Golden Wild symbol substitutes for money symbols only, but 5 wild symbols on the same payline have the biggest payout. 3 or more Bonus Coin symbols scattered on the reels trigger the bonus game. The player chooses which billionaire's game to play, and then chooses a number of objects to reveal bonus prizes. 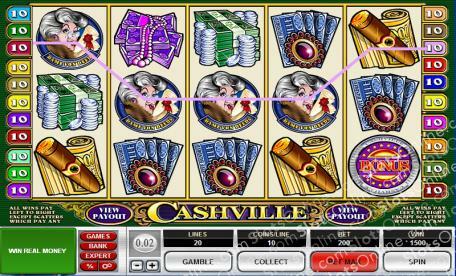 Another bonus is the gamble minigame, where players can double their slots wins by guessing the color of a playing card. Correct guesses win double the slots win, but incorrect guesses mean the staked winnings are lost.